Brock Lesnar defeats Big Show (w/ Paul Heyman) at 6:15 to earn a spot in the Royal Rumble match. Lesnar hits a couple of early suplexes, but Show withstands the punishment and goes to work on The Next Big Thing. Heyman interferes to make sure Show stays in control, and Lesnar brings him into the ring for an F-5! Show makes the save and hits a Chokeslam, but it only gets two! He goes for another one, but this time Lesnar breaks free. One F-5 later and Lesnar is in the Rumble. Much like the bonus match from RAW, this was nothing special but at least it served a purpose. The Dudley Boyz (Bubba Ray Dudley & D-Von Dudley) defeat World Tag Team Champions William Regal & Lance Storm to win the titles at 7:26. Regal and Storm have been the Champions since 1.6.03, and this is their first defense. Bubba and D-Von have different colored camouflage on, so thankfully we’ll be able to tell them apart tonight. They control the firsts brief portion of the match, and then the Champs take over and isolate D-Von. So, it’s like every Dudley Boys match ever. Bubba gets the hot tag and he’s a house afire. Chief Morley tries to interfere, but it backfires when D-Von gets control of Regal’s brass knuckles and decks Storm with them to get the pin. Another TV-level match in a series of them tonight, with the Dudleys doing their routine with zero deviation from the norm. Torrie Wilson defeats Dawn Marie at 3:35. This was during the ‘Dawn Marie is married to Torrie’s “dad”’ angle. These two are not exactly the cream of the women’s wrestler crop, and they prove it by having an awkward match with terrible execution. Torrie wins with a neckbreaker. I can’t believe they thought this needed to be on pay-per-view. Scott Steiner defeats World Heavyweight Champion Triple H (w/ Ric Flair) by disqualification at 17:00. HHH has been the Champion since 12.15.02, and this is his first defense. The challenger controls the early portions of the match, working a slow pace and trying to keep his wind. Seriously, Lawler is trying to sell Steiner as “hurt,” but he’s just winded AF. What I find amusing about Steiner being lazy and doing nothing but suplexes in this match, is that he gets booed out of the building for it, and over a decade later Brock Lesnar turns that strategy into getting paid a ton of money for doing very little. Life is funny sometimes. Flair interferes wherever he can, and even tries to help HHH bail on the match. The battle on the floor for a while and HHH gets busted open. After putting up with Steiner for a little while longer, HHH gets bored and brings in a sledgehammer and hits Steiner with it to draw the disqualification. Steiner beats up both Flair and HHH after the bell as the crowd showers him with boos. Well that was a disaster, as Steiner looked completely lost and couldn’t keep with HHH at all. And it’s not like HHH was in top form in 2003 either, so, yikes. WWE Heavyweight Champion Kurt Angle defeats Chris Benoit at 17:18 to retain the title. Angle has been the Champion since 12.15.02, and this is his first defense. There were just a few guys capable of chain wrestling with Angle and appearing to be in his league, and Benoit was one of them. In stark contrast to the previous match, Angle and Benoit work with purpose and at a rapid pace. These two talented grapplers exchange holds and reversals and counters, making HHH and Steiner’s match look even more foolish by the second. Angle and Benoit use holds both familiar and foreign to them, trying to catch their opponent off-guard. Late in the contest, Angle cinches on an Ankle Lock, and counters all of Benoit’s counters to keep the hold on. Angle adds a leg grapevine and Benoit has no choice by to tap out. With all the focus on Angle v Brock at this time, this match always felt like a placeholder, and that’s the only fault I can find with it. This is a classic wrestling match between two of the greatest ever, both at the top of their game. These two always clicked and this is arguably their best match against each other. Brock Lesnar defeats A-Train, Batista, Bill DeMott, Booker T, B2, Charlie Haas, Chavo Guerrero, Chris Jericho, Christian, Christopher Nowinski, Eddie Guerrero, Edge, Goldust, Jamal (w/ Rico), Jeff Hardy, John Cena, Kane, Matt Hardy Version 1.0 (w/ Shannon Moore), Maven, Rey Mysterio, Rikishi, Rob Van Dam, Rosey (w/ Rico), Shawn Michaels, Shelton Benjamin, Tajiri, Test (w/ Stacy Keibler), Undertaker, and Tommy Dreamer at 53:47 in the Royal Rumble match. Michaels is #1 and Jericho is #2. Jericho uses Christian as a decoy during his entrance, so he can sneak up behind Michaels and deliver a low blow. He further Destroys Michaels, busting him open with a steel chair just prior to dumping him to the floor. Nowinski is #3, and Mysterio is #4. Edge is #5, and Christian is #6. Next up is Chavo at #7, and Mysterio eliminates Nowinski with a headscissors. Jericho eliminates Mysterio just seconds later. Tajiri is #8, and DeMott is #9. Things pick up when Tommy Dreamer comes out at #10 and brings weapons with him. Edge uses a kendo stick to eliminate DeMott. Jericho gets rid of both Dreamer and Tajiri, and Edge eliminates the #11 entrant B-2. Edge eliminates Chavo and Jericho eliminates both Christian and Edge to take sole possession of the ring. Rob Van Dam is #12 and Matt Hardy pulls lucky #13. Eddie is #14, and we reach the halfway point with Jeff Hardy at #15! Rosey starts off the second half at #16, and Test is #17. John Cena rap his way to the ring at #18, and Haas follows at #19. RVD eliminates Jeff, leaving only one Hardy in the match now. Rikishi is #20 and Jamal is #21. Kane is #22, and he gets to the ring in a hurry, ready to take advantage of a weakened field. He eliminates Rosey in short order. Benjamin is #23, and Booker is #24. Booker is a house afire, and he shows off the Spinaroonie before eliminating Eddie. A-Train is #25, and then Michaels comes running out from the back to attack Jericho! Test takes advantage of the situation and tosses Jericho out! Maven is #26 and Goldust is #27. Benjamin and Haas work together to eliminate Goldust and then Booker. Batista is #28, and he eliminates Test and Rikishi. Lesnar is #29, and he quickly clears both members of Team Angle and the remaining Hardy out of the ring. Undertaker completes the field at #30. He tosses Cena, Jamal, and Maven straight away. Kane and RVD team up to eliminate A-Train, and then Kane dumps RVD! Every man for himself, obviously. We’re down to the final four – Batista, Lesnar, Kane, and Undertaker. After Undertaker eliminates Batista, It looks like he joins forces with Kane, but he immediately double-crosses his half-brother and dumps him out! Seconds later, Lesnar eliminates Undertaker and wins the 2003 Royal Rumble. Outside of a few good spots (Hardy v Hardy, Jericho v Michaels, Maven trying to eliminate Undertaker again), this was a pretty uneventful edition of the match with a predictable winner. The Rumble match is fun but not amazing, but the WWE Title match is worth the price of admission alone. Also, the Triple H v Scott Steiner match is a legendarily bad match and is totally worth going out of your way to see. 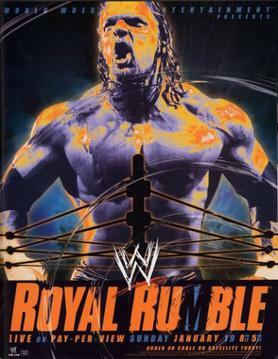 The rest of the undercard is completely forgettable, making this one of the weaker overall Rumble cards in history.